Renewable Energy Standard (RES) | Grand Valley Rural Power Lines, Inc.
Renewable Energy Standards (RES), also known as Renewable Portfolio Standards (RPS), are policies designed to increase generation of electricity from renewable resources. These policies require electric companies to acquire a certain minimum share of their electricity from designated renewable resources. Generally, these resources include wind, solar, geothermal, biomass, and hydroelectricity. 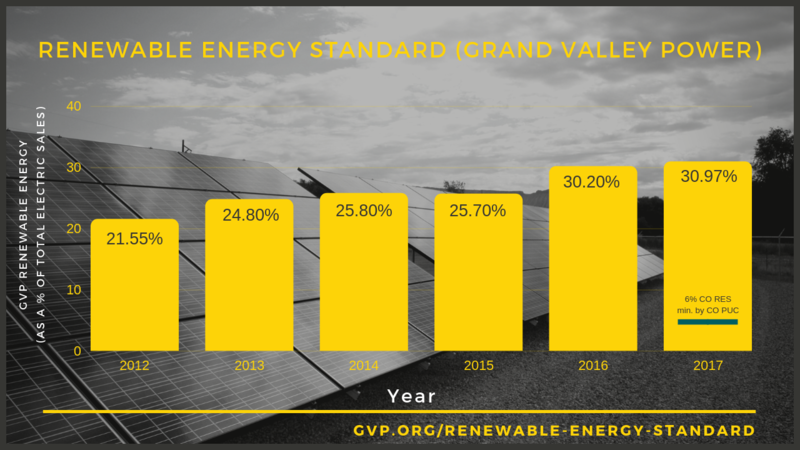 For compliance years 2020 and thereafter, Grand Valley Power must also supply 1% of its retail sales from renewable distributed generation, of which 50% must be from retail renewable distributed generation. The report filed with the Colorado PUC for compliance year 2017 is available at the link below.